Case Study: Jacob E. Manch Elementary School3-Dimensional play and learn space engages students’ minds and bodies. 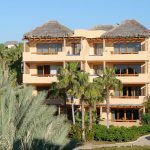 SEMCO’s X-Bond Seamless Stone and Pre-Stain System was the perfect solution, given its ability to be applied directly to, and form a chemical link with, the existing substrate, creating a durable, permanent surface requiring minimal maintenance. 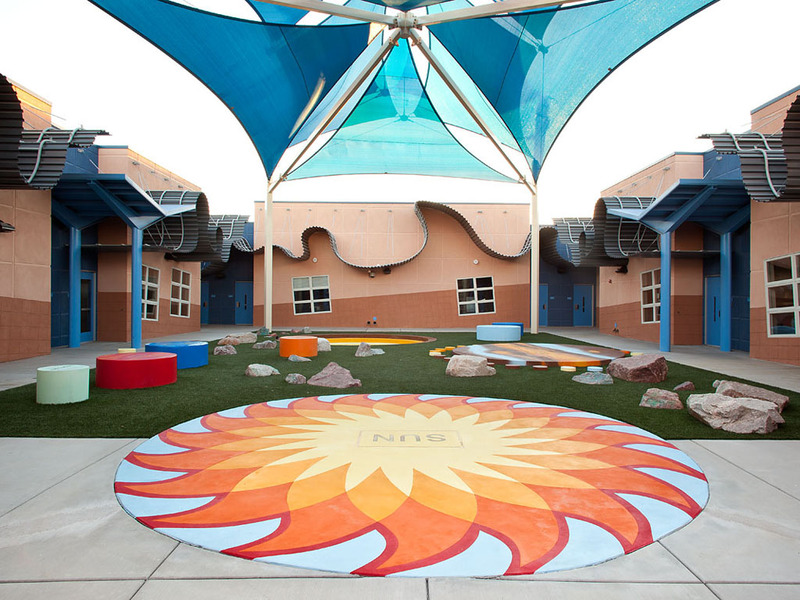 The end result was a vibrant, 3-dimensional play and learning space to be enjoyed by children for decades to come. 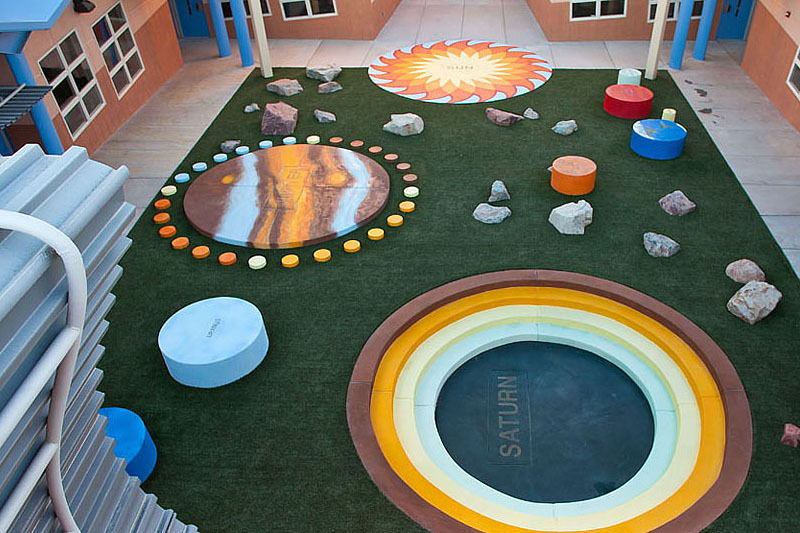 Ken Small first presented his unique galaxy playground design to a concrete manufacturer, stressing that the project must feature vivid, energetic colors. Unfortunately, concrete couldn’t meet the requirements. 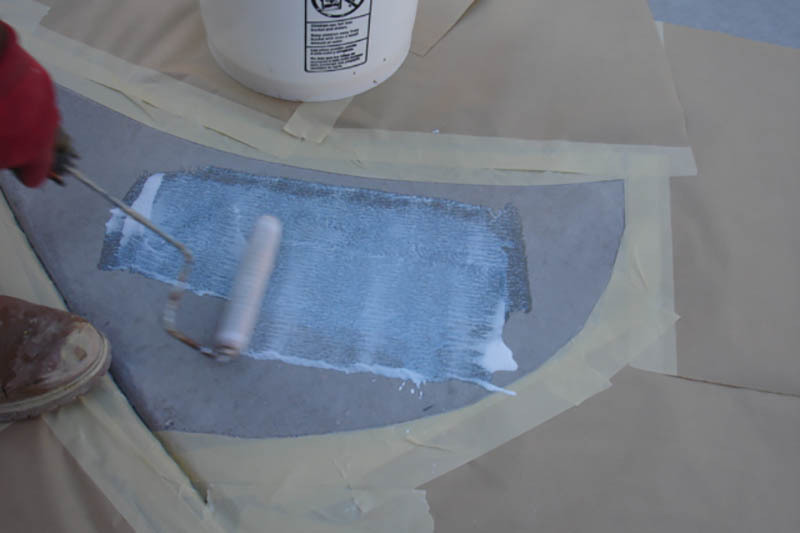 Similar issues arose when he sought a paint manufacturer to create a faux finish; the company couldn’t guarantee that the finish would meet the school’s standards for longevity and UV-resistance, nor guarantee the necessary coefficient of friction. Case Study: Jacob E. Manch Elementary SchoolSEMCO team at the job site. Case Study: Jacob E. Manch Elementary SchoolRaw concrete elements awaiting SEMCO resurfacing treatment. 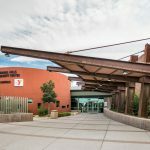 Only SEMCO’s X-Bond Seamless Stone could meet—and exceed—the project’s criteria, also qualifying for the 4-point of Leadership Energy Environment Design (LEED) system. This means our green products and applications are not just beautiful and long lasting, they’re also environmentally friendly. 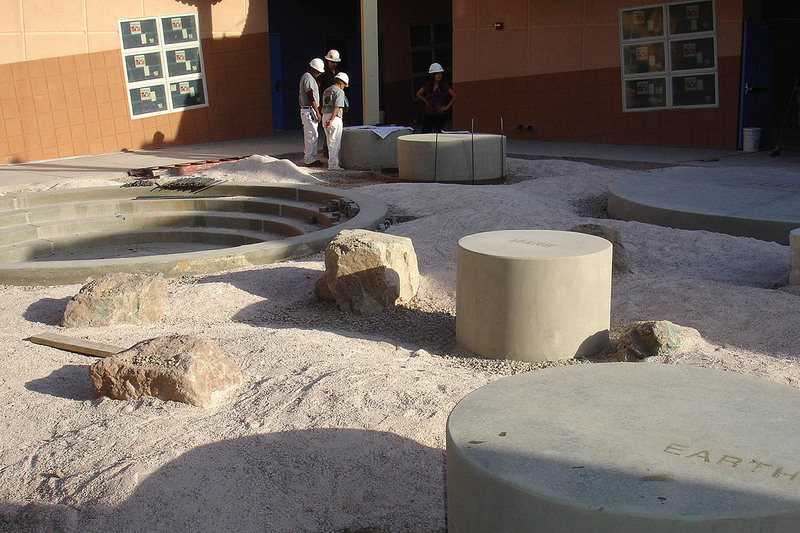 SEMCO’s surfacing engineers embarked on the project in summer 2009, on a smoldering 115 degree Las Vegas day, since the project needed to be completed during summer break. 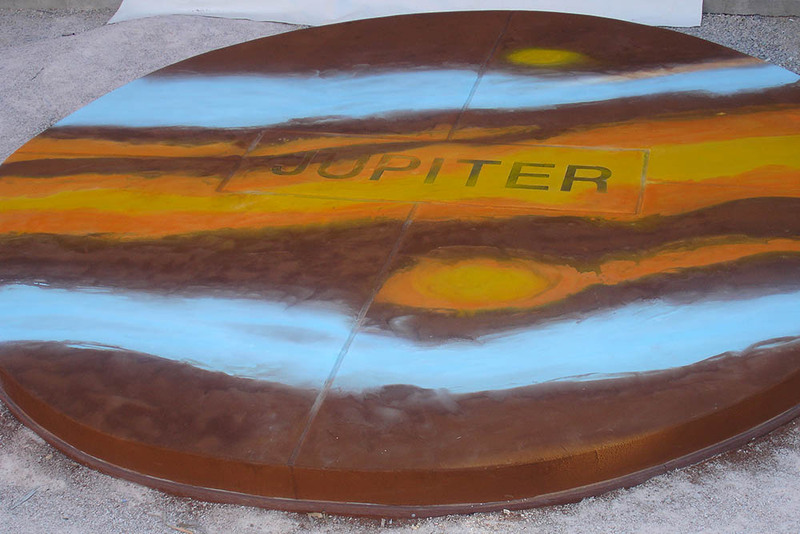 The project was unique as each component of the solar system required different surface treatments. 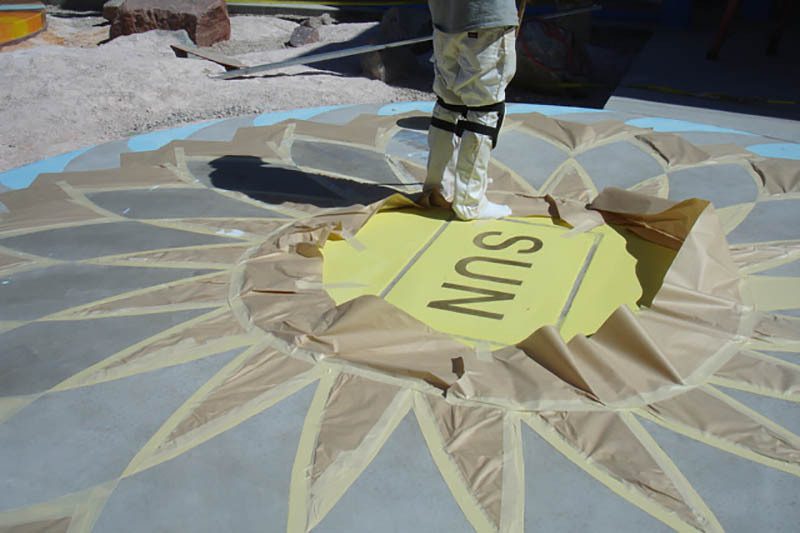 SUN: To create the sun, the team used stencil templates made of plywood, drew lines into the concrete, scored the concrete with a circular saw with a diamond tipped masonry blade, then started masking areas for each color. 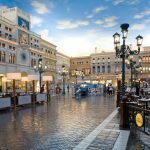 Color Bond (X-Bond Seamless Stone with integrated color) was applied one area at a time, after which the entire space was sealed it with X-Crete 500, providing a flat finish and added protection. 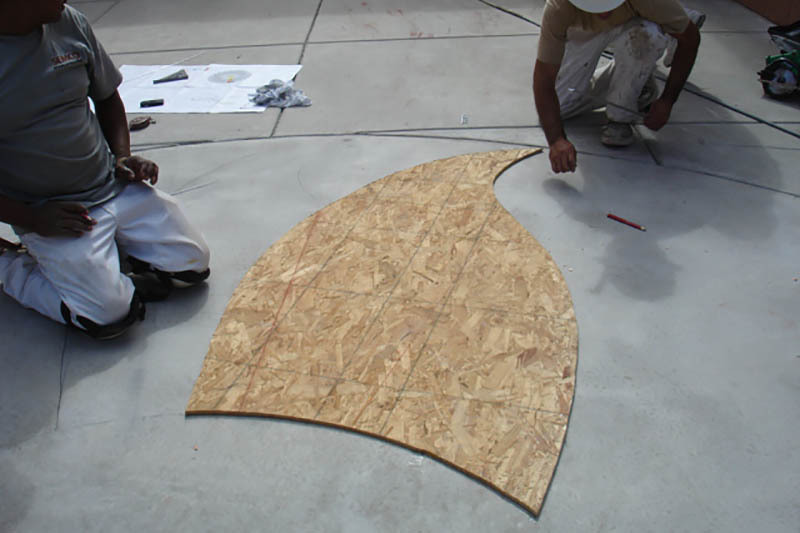 Case Study: Jacob E. Manch Elementary SchoolTo create the sun, SEMCO installers used stencil templates made of plywood. Case Study: Jacob E. Manch Elementary SchoolMasking before X-Bond Seamless Stone Color Bond application. Case Study: Jacob E. Manch Elementary SchoolPriming with X-Bond Liquid. 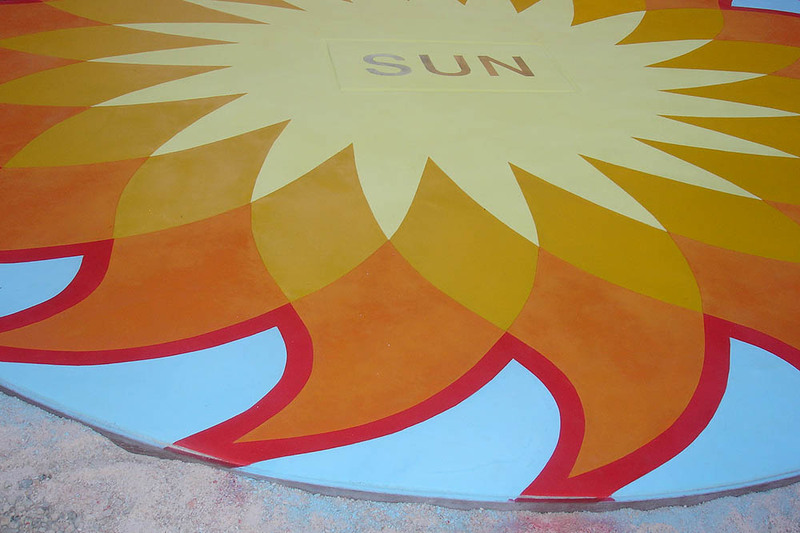 Case Study: Jacob E. Manch Elementary SchoolVibrant sun design showcases several Color Bond colors. 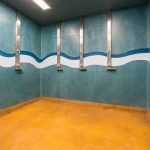 JUPITER: The team used a variety of Color Bond mixes blended directly on the surface to create smooth transitions between colors; then the Natural Stain was sprayed, again with different colors to create smooth, blending effect. Case Study: Jacob E. Manch Elementary SchoolColor Bond mixes blend directly on the surface, creating a beautiful, organic look. 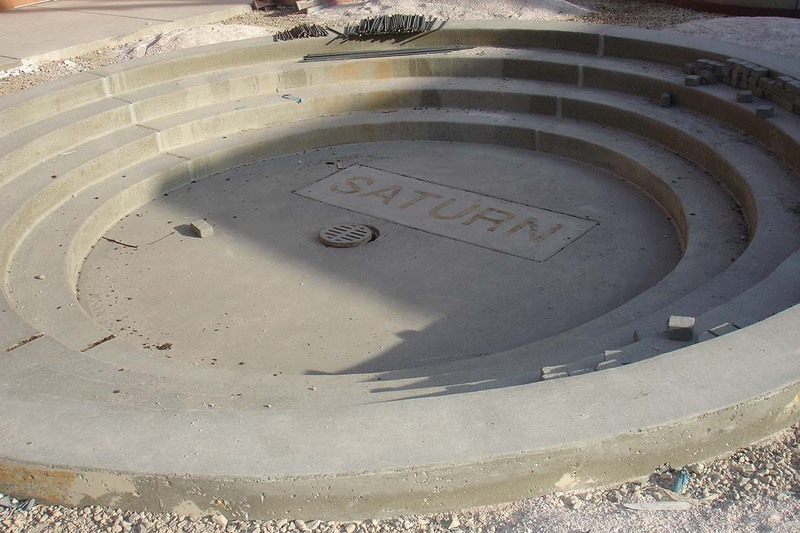 EARTH: To create the raised, cylindrical Earth portion of the Solar System, our team used paper stencils to transfer outlines directly onto the cylinder-shaped concrete base. We then used Color Bond to create the 3-Dimensional areas of land and snow, followed by the Natural Stain to create the stunning earth representation. The entire “planet” was crafted by hand—a true one of a kind masterpiece perfect for learning and playing. 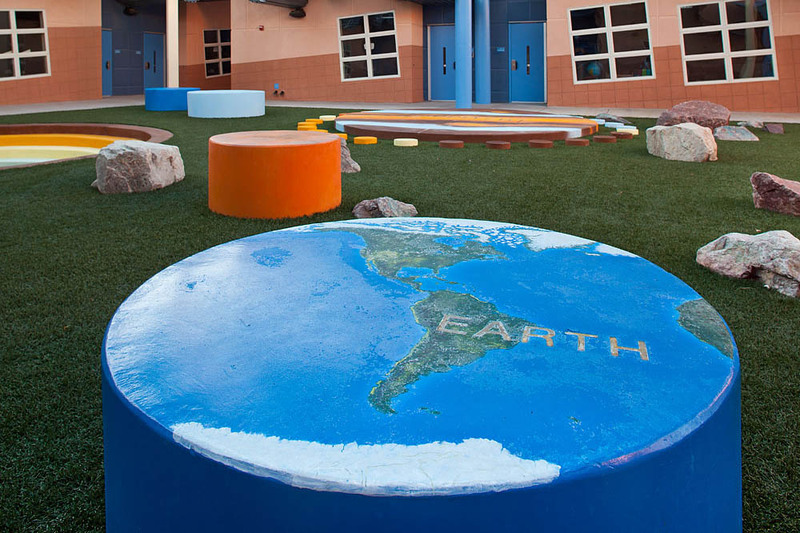 Case Study: Jacob E. Manch Elementary SchoolCompleted cylindrical Earth design emerges as part of the Solar System. 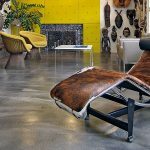 Once completed, we applied an additional 1/16” layer of Color Bond over the entire project, and sealed it with X-Crete 500, giving it a flat finish and providing an extra layer of durable protection. Led by Semco Project Manager Nina Sem, the team completed the project in only 32 days—60 days ahead of schedule. By following Semco’s comprehensive step-by-step application matrix, they were able to ensure high quality standards throughout each phase of design and application. 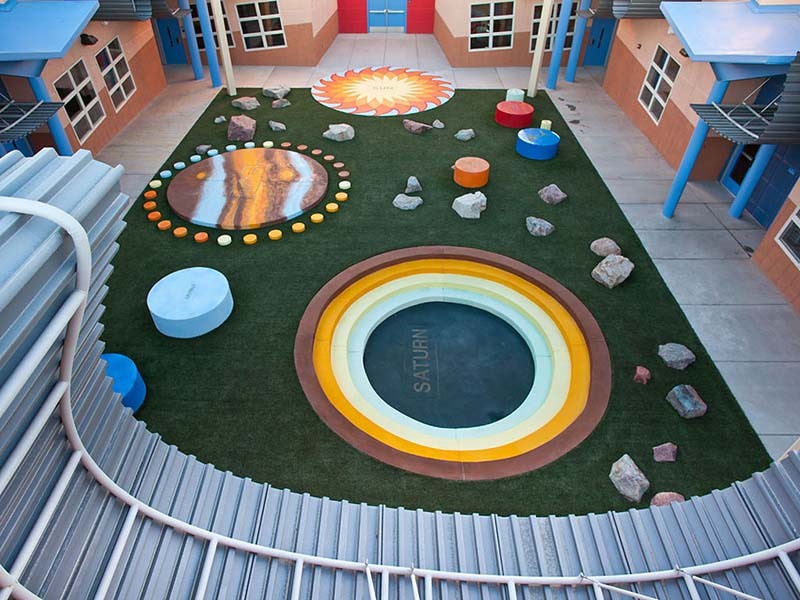 From its colorful, 3-dimensional rings of Saturn to the vibrant overlapping rays of sun, to the climbable planets and space “rock,” this stunning playground brings the entire galaxy to life for Vegas school children—and will continue to do so for years to come. 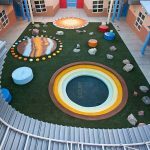 The school district and Ken Small were ecstatic with the final product—which was just as they had imagined it, both visually and in terms of its environmental benefits and safety standards. Case Study: Jacob E. Manch Elementary SchoolBold colors, smooth transitions... playground is ready for the new school year! 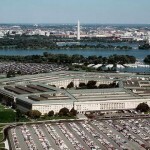 The project was awarded a silver rating for meeting the U.S. Green Building Council standards.